Gideon and Deborah are twins. When they first arrived at the orphanage they were named Prince and Princsila. The Grandmother changed their names to Gideon and Deborah. Gideon and Deborah came from the Western Region. Both parents have passed away and they were under the care of their grandmother. It is there believe that their grandmother is their mother as their mother has passed at a very young age and they had never know her. The Grandmother had been taking care 16 children as all her siblings have died. Of the children was their cousin Joyce. At the orphanage, Joyce is considered their mom. 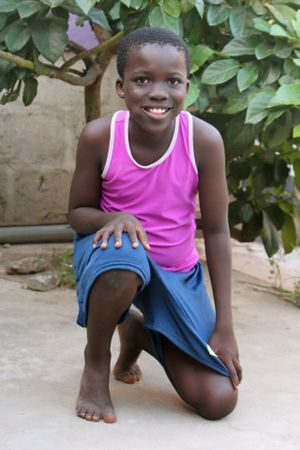 When they first came here, Patrick found an aunt who had traveled to the Ivory Coast and has since settled in Kasoa. When the children's parent had passed away, she was to be the caregiver. Leaving for the Ivory Coast, she then left the children with their grandmother. Patrick started talking to the woman and recognized the accent. He quickly mention the children and she admitted they were her niece and nephew. An attempt was made to have them stay with her, unfortunately when they did, they did not attend school. Patrick visited the home to check on both Gideon and Deborah. The state of their health was poor. They begged to come back. Both children are very happy and grateful to be living at the orphanage.